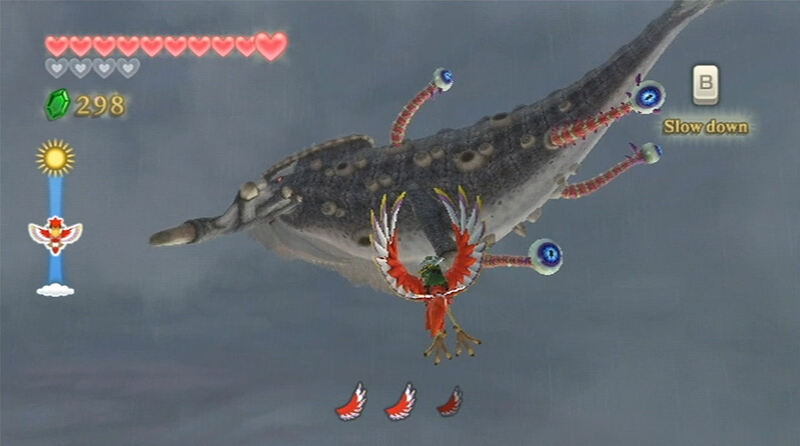 Below, you'll find a Skyward Sword Bosses guide, listing all of bosses that have been seen within screenshots and trailers of Skyward Sword. The information listed below is incomplete and will be updated as more information becomes available. 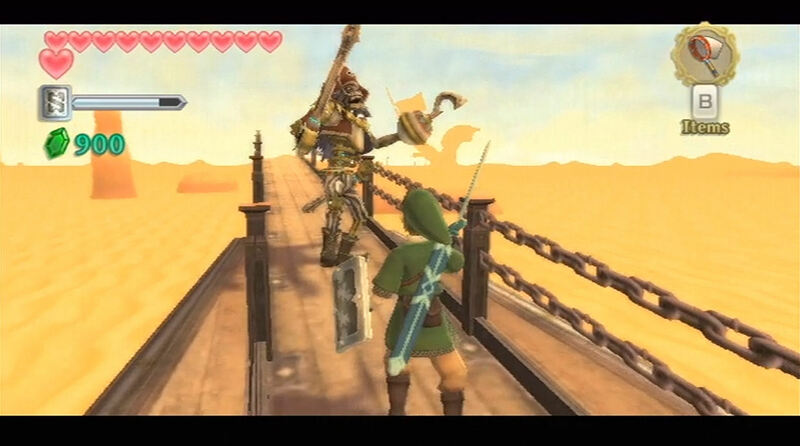 For full context of where Link encounters each Skyward Sword Boss, be sure to take a look at our Skyward Sword Walkthrough. Click the image of the boss to see how to defeat them. 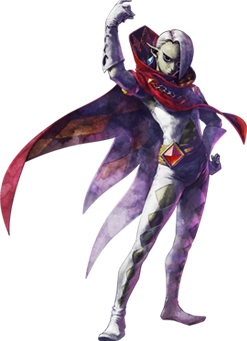 During the first phase of the battle, Ghirahim will walk up to you, holding his fingers up, waiting to catch your sword as you slash at him. The key to harming him at this point, is to quickly turn where your sword is and slash at him. 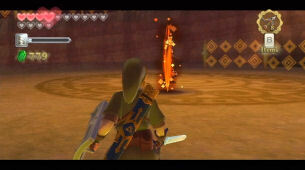 Hold your sword on the right and Ghirahim will block in that direction. 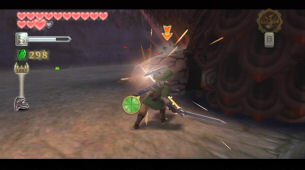 Then quickly deliver a sword slash from left to right using your Wiimote and you'll hit him almost everytime. 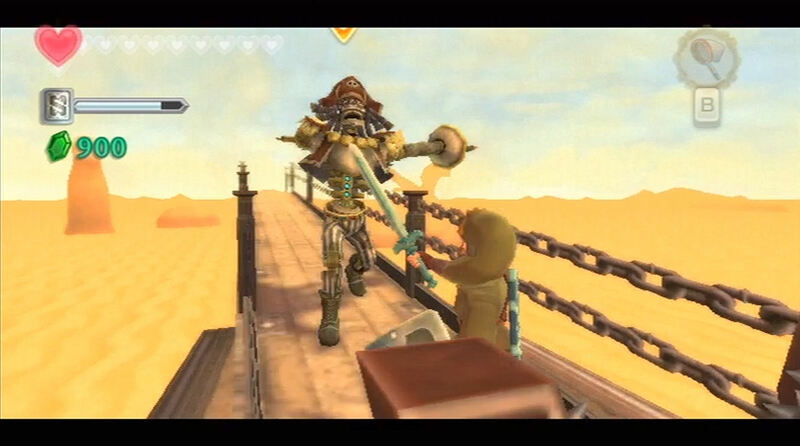 If Ghirahim does catch your sword, quickly waggle your Wiimote to break free. Just continue hitting in this fashion until he changes up his attacks. 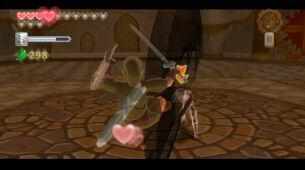 Ghirahim will eventually jump back and will equip a sword of his own. 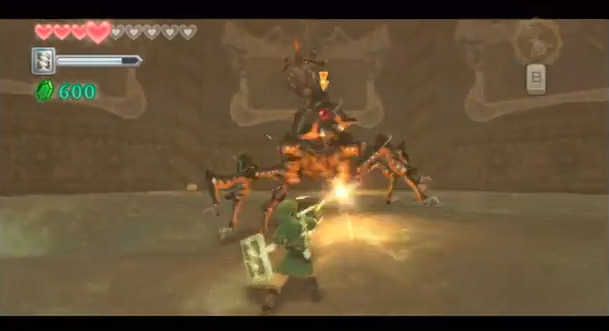 He will summon red beams and send them out in Link's direction. 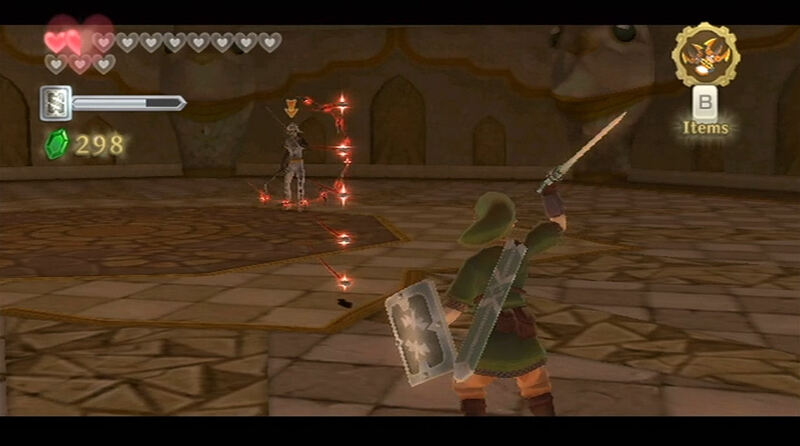 They will always be in a direct line, so perform a sword slash in that same direction to deflect them away. 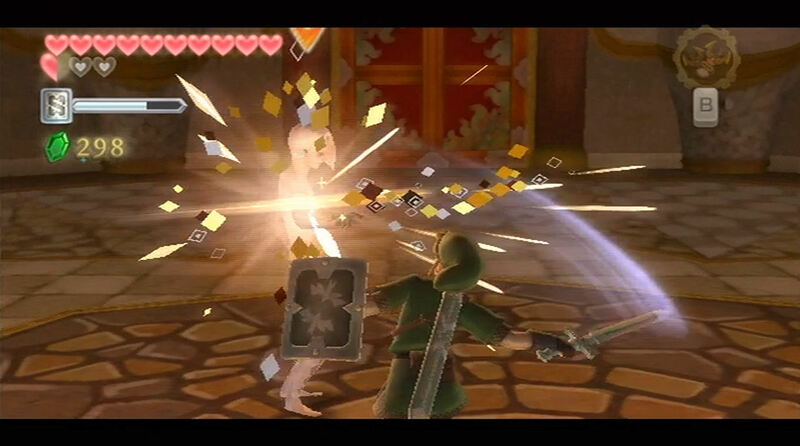 Alternatively you can just run away from these attacks or use a shield bash. Ghirahim will also perform another new attack where he lowers his body and charges directly at you, performing a sword slash. This attack is much more difficult to run away from and your best is to use your shield to defend yourself. 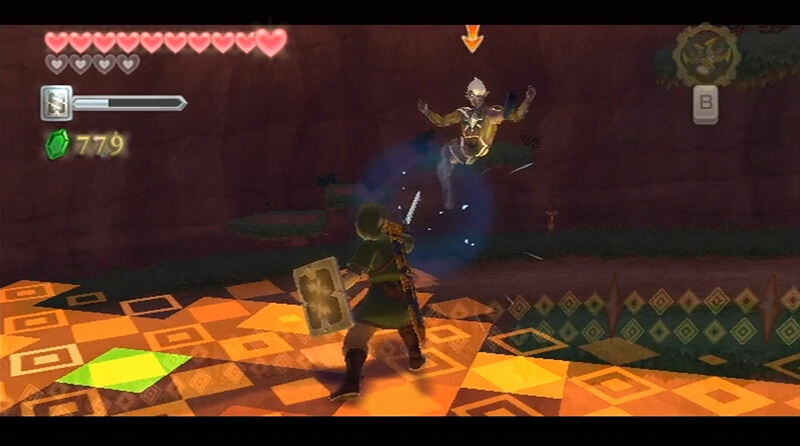 If you deliver a shield bash just as Ghirahim is about to strike you, your shield will stun him, leaving him vulernable for attack. 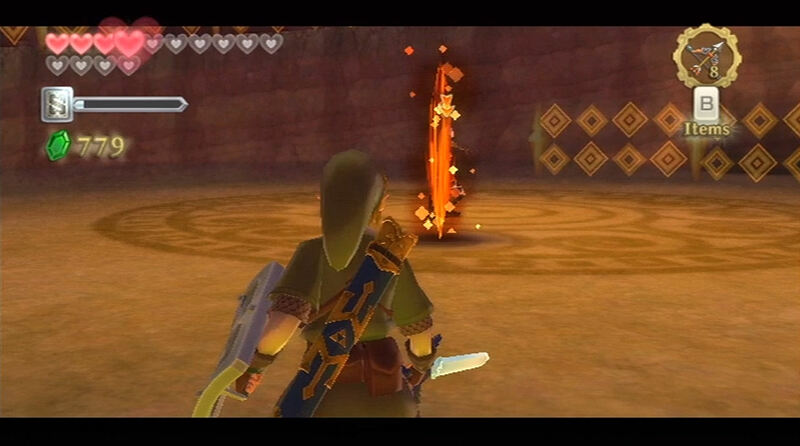 Alternatively you can time a sword slash so that you hit him once he gets really close to you. Ghirahim will either run to the left or right of and you must deliver a sword slash in the direction that he charges at you. After an initial hit, you can deliver a number of consecutive hits to harm Ghirahim. Lastly, Ghirahim will teleport throughout the room, appearing right behind Link where he will deliver a traditional sword slash. 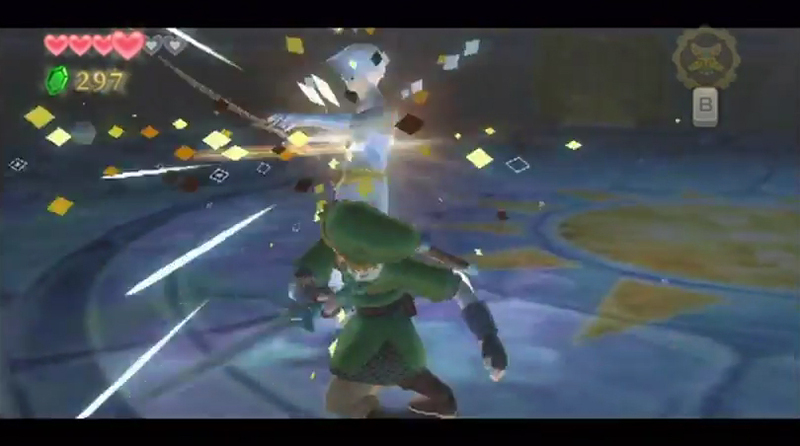 As soon as Ghirahim teleports behind you, he holds his sword in a certain direction, blocking one of the direction attacks. Quickly deliver a sword slash from any other direction to harm him. 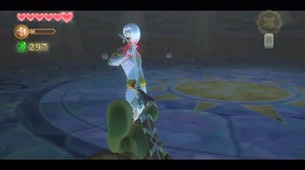 That is about all there is to the Ghirahim battle. There are several pots on the side of the room that contain recovery hearts, so you can use those if you get in trouble. If you are have serious problems, then I suggest using the bird statue outside of the boss room to return to the sky and get some potions from the potion shop. 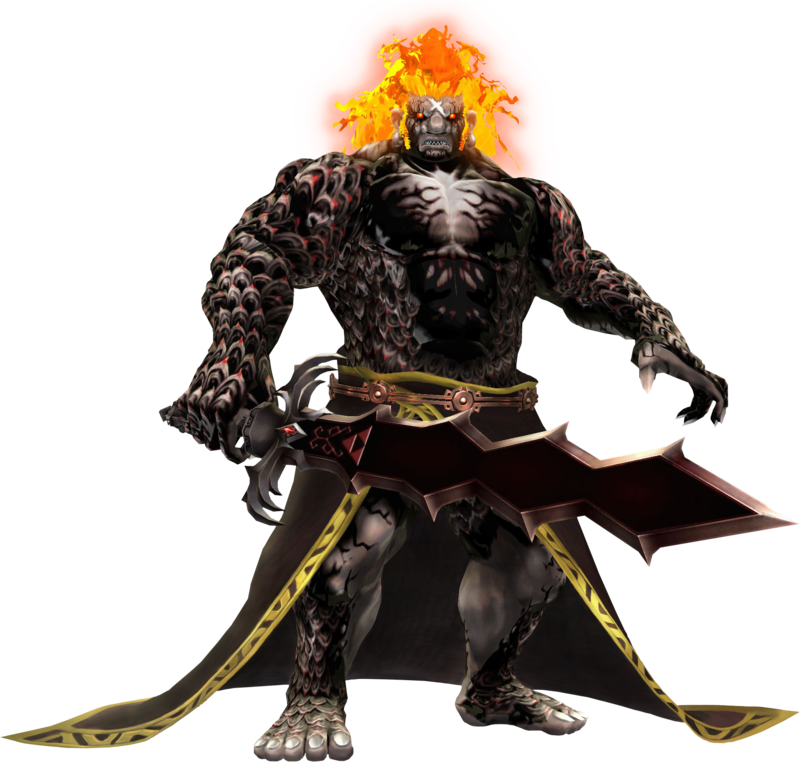 Read More about Demon Lord Ghirahim at the Zelda Dungeon Wiki. Scaldera is the boss of the second dungeon in Skyward Sword, the Earth Temple. 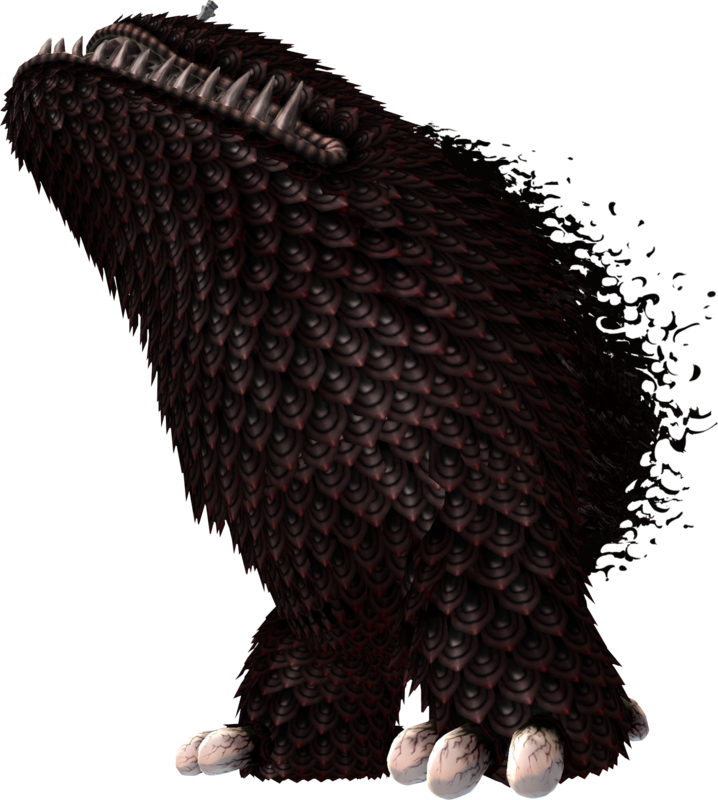 He is very similar in size and shape to a mini-boss from Spirit Tracks, a simple Rocktite. 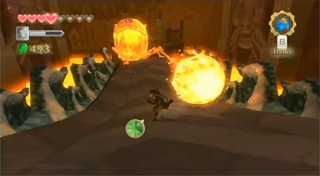 When the battle begins, Scaldera will shoot fireballs in different directions and Link will need to run up the slope while dodging the fireballs. 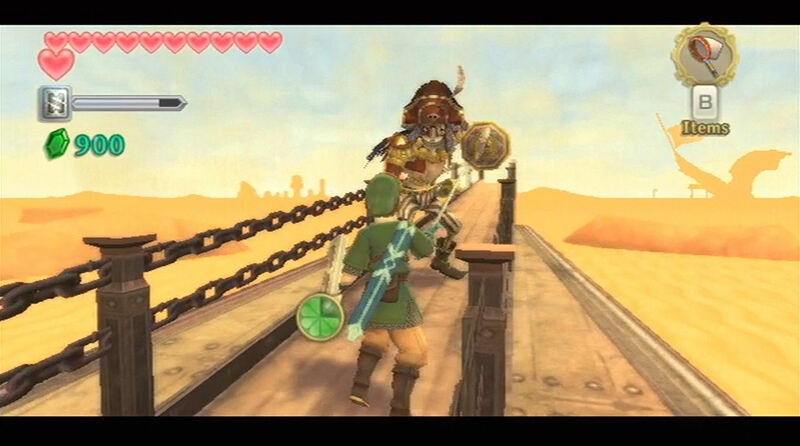 Soon after, Scaldera will chase Link up the slope. 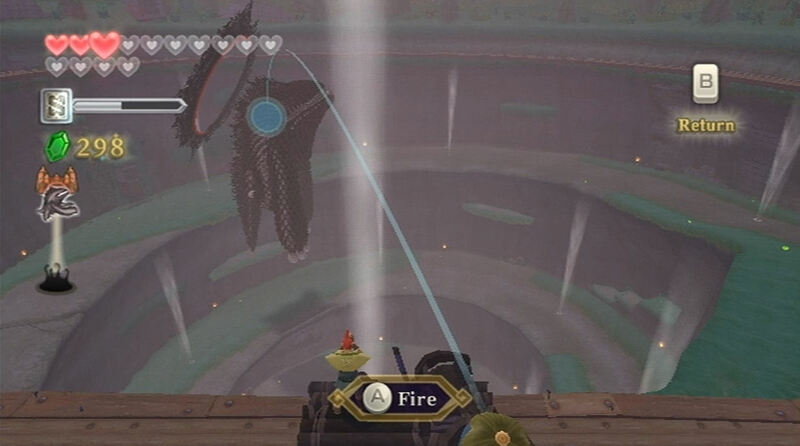 While he does this, Link can roll a bomb down the ramp, which will explode when it comes in contact with Scaldera's fiery body. This will cause him to roll back down the ramp, and will start the previous process over. 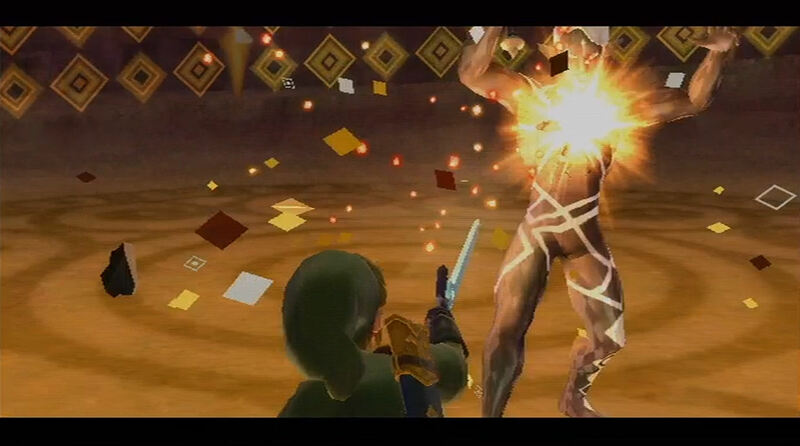 If Link so chooses too, he can also run up to Scaldera and throw bombs in his mouth when he inhales. This will cause much greater damage to him, and will break his exterior quicker. Scaldera also has another attack, as it will quickly run up the slope. 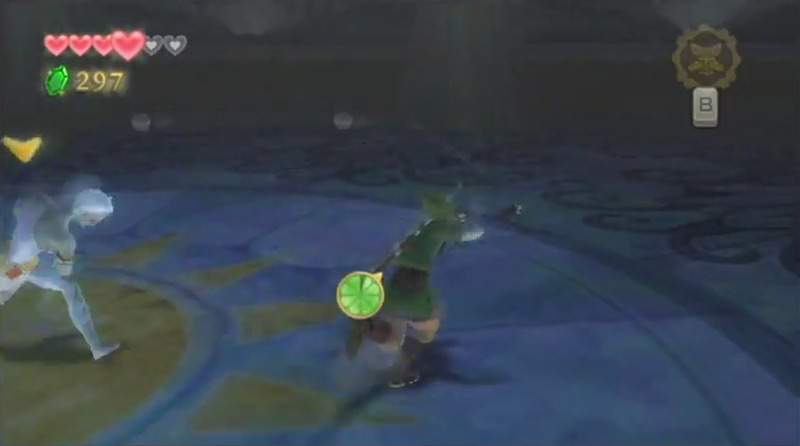 Link can stand underneath its body to dodge it running. When it gets to the top of the ramp, it will roll back down the ramp. 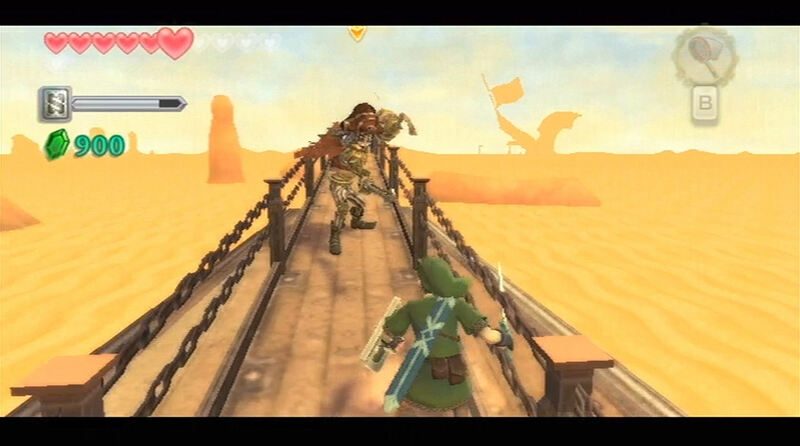 To dodge this, Link must move to either side of the ramp and stay there until Scaldera has passed him. If at any time you need to restore your health, there are many hearts avaliable at the top of the battlefield where Scaldera cannot attack you. After a few hits, Scaldera's hard exterior will start to break apart. At this point, Link can run up to Scaldera and use the sword slash at its colorful eye, damaging it. 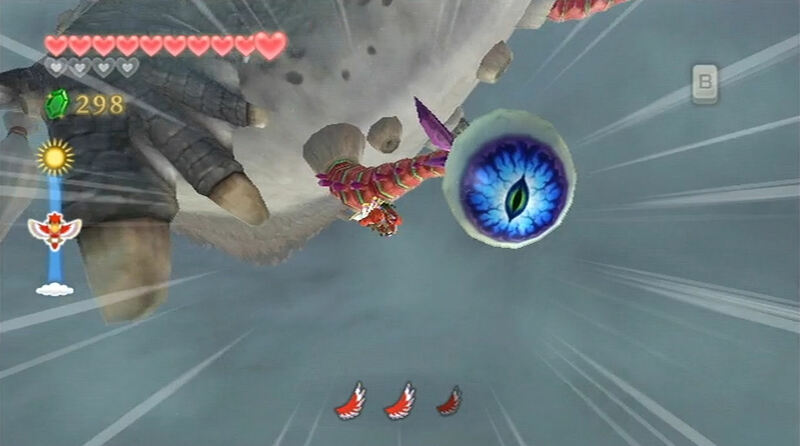 To defeat Scaldera, Link must repeat this process and continue to attack the eye until it's defeated. 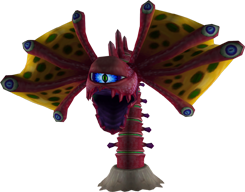 Read More about Scaldera at the Zelda Dungeon Wiki. Moldarah is the boss of the Lanayru Mining Facility. It is a scorpion, and will use the sand and its claws to make Link's life a lot worse. Moldarach's weakness are the eyes on its two claws. To harm him, Link will need either horizontally or vertically at the claws, depending on how Moldarach positions its claws. After being hit, the claw will turn black briefly, then turn colorful again, ready to be attacked further. 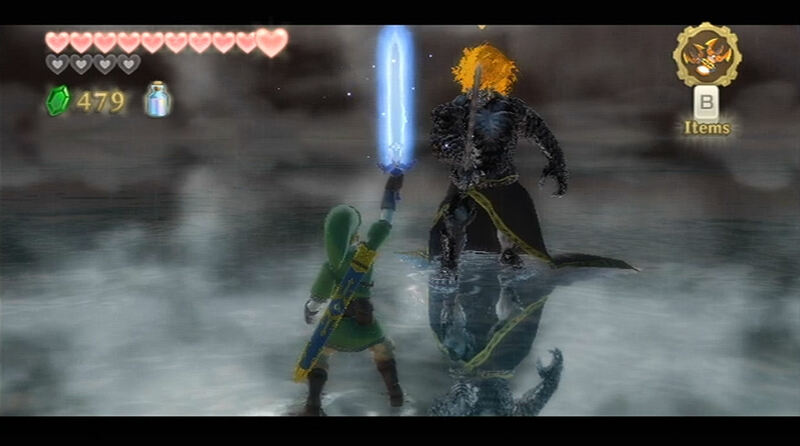 Moldarach has only one attack to harm Link. At some point, one of Moldarach's claws will turn red, signifying it will lunge at Link in an attempt to grab him. 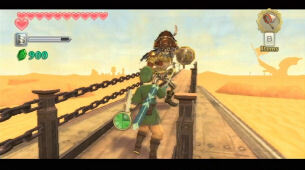 To counteract this, Link can simply dodge out of the way. 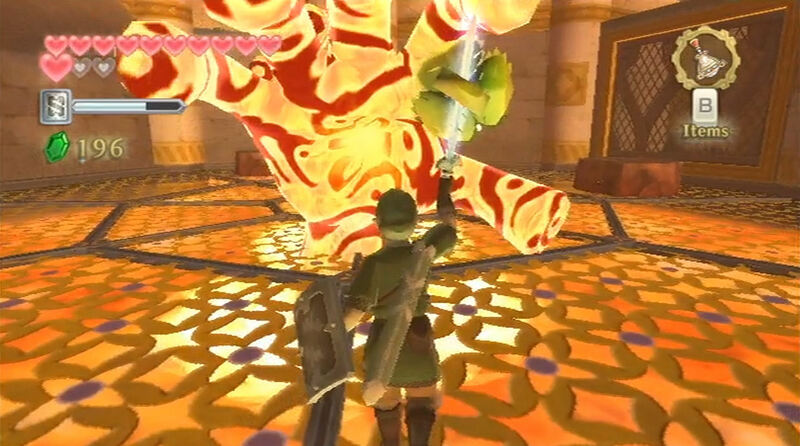 If the claw grabs a hold of Link, he can simply shake to become free once more. 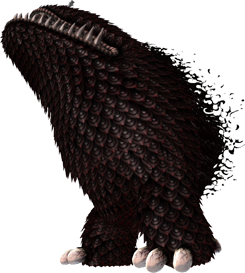 After one claw has been sliced enough, it will disappear from Moldarach, cutting down his attack power in half. 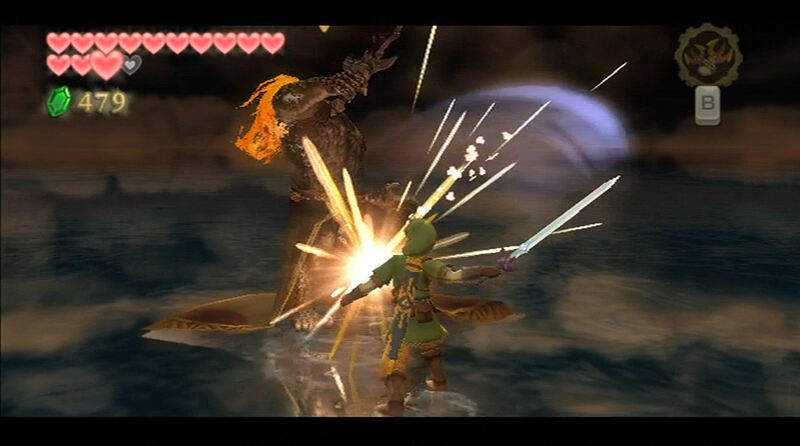 Link will need to continue the same method as before on the second claw to defeat the first phase of Moldarach. When both claws are gone, Moldarach will change its attack pattern by diving into the sand to hide momentarily. You can follow its movements by watching the sand for a large bump, signifying where Moldarach is. You can either use the Gust Jar to blow away the sand covering it, or wait until it pops out of the sand. After popping out of the sand, Moldarach will attempt to swing its tail at Link, trying to damage him with his spikey tail. 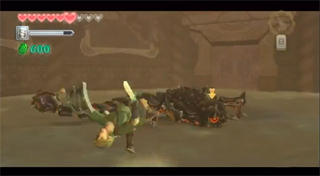 Link can roll or jump out of the way to dodge its spikes. 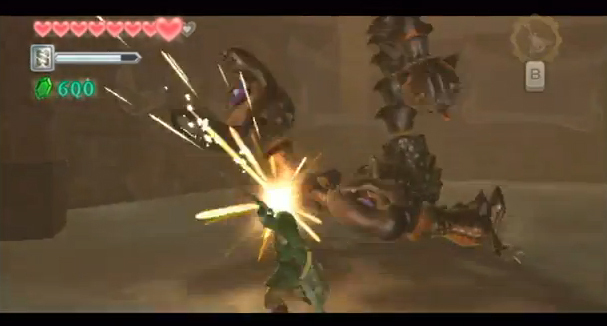 Moldarach may also try to ram at Link with its entire body, taking a full two hearts of damage-it's strongest attack. 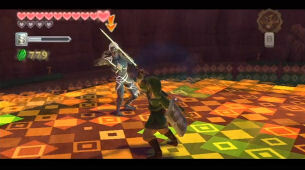 If Link is agile enough, he can dodge to the left or right to avoid it. 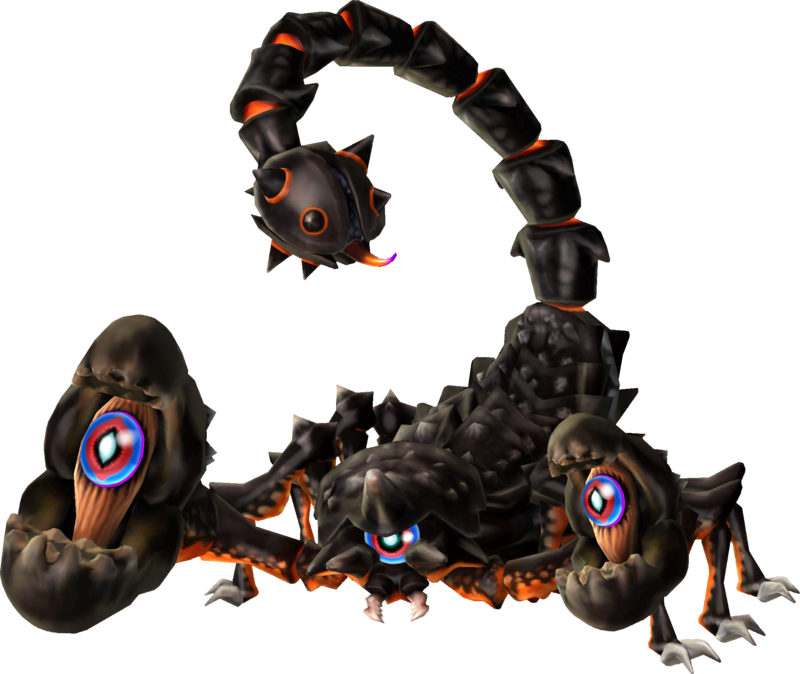 As a last attack, baby scorpions known as Aracha will continually pop out of the sand and will try to attack Link. 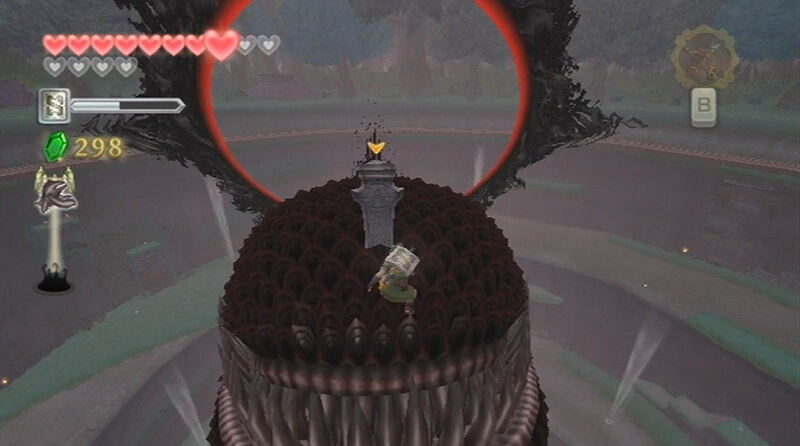 They are easy to defeat though, as they can be blown away with the Gust Jar or killed with one slice of the sword. To finish Moldarach off, Link will need to stab the eye on the front of it. After being hit once, Moldarach will disappear back into the sand. After repeating this process a few times, Moldarach will be defeated. Read More about Moldarach at the Zelda Dungeon Wiki. Standing at 50 feet tall, The Imprisoned is a large, black, and hairy monster in Skyward Sword. It is imprisoned (hence the name) in the Sealed Grounds, located right outside Faron Woods. 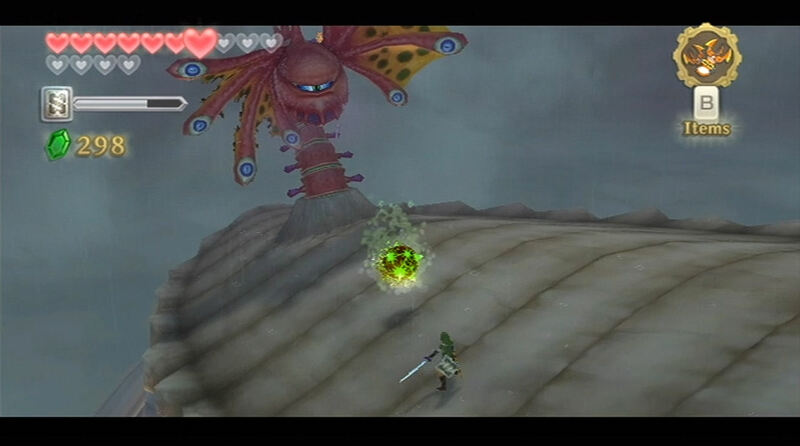 Link first sees this monster in his dreams, and he will be a continued presence throughout the game. During the fight, The Imprisoned will slowly walk up the ramp to the top of the Sealed Grounds. To stop him from progressing, Link must slash at his toes multiple times to break each one. After the last one is destroyed, The Imprisoned will fall on this back. 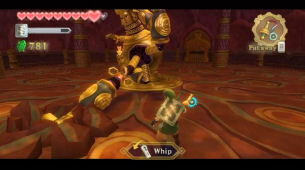 At this point, Link can run to The Imprisoned's head and slash at the pillar in his head. 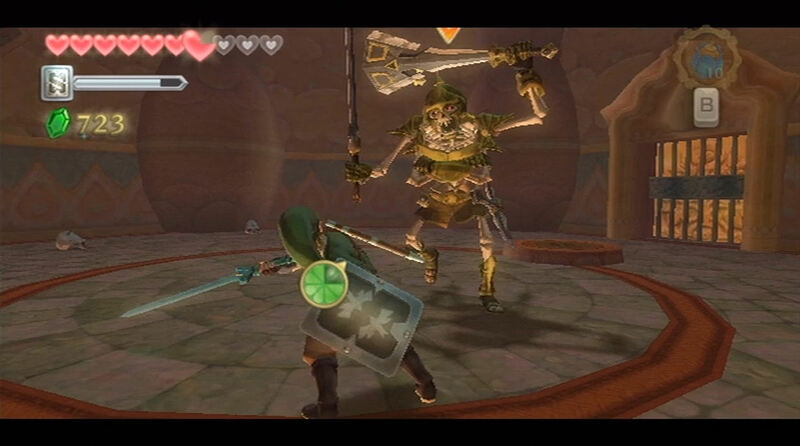 After slashing multiple times, The Imprisoned will stand upright again, and Link must continue this process to defeat him. To defeat The Imprisoned in perhaps and quicker and more effective way, you can also use the Sail to float up to the next level of ground above the monster. When he draws near, you can jump onto his head and slash at the pillar on its head. The Imprisoned has very little in terms of attack. His only real attack is either contact with Link, or by stomping on him when Link becomes careless and walks underneath his foot, or is within the radius of damage the stomp will produce. These can easily be dodged by being careful when attacking the toes. After a few hits, The Imprisoned will also slither across the ground and shoot far up the ramp. This can be dodge by either jumping down to a lower level or by flying up to the next level. 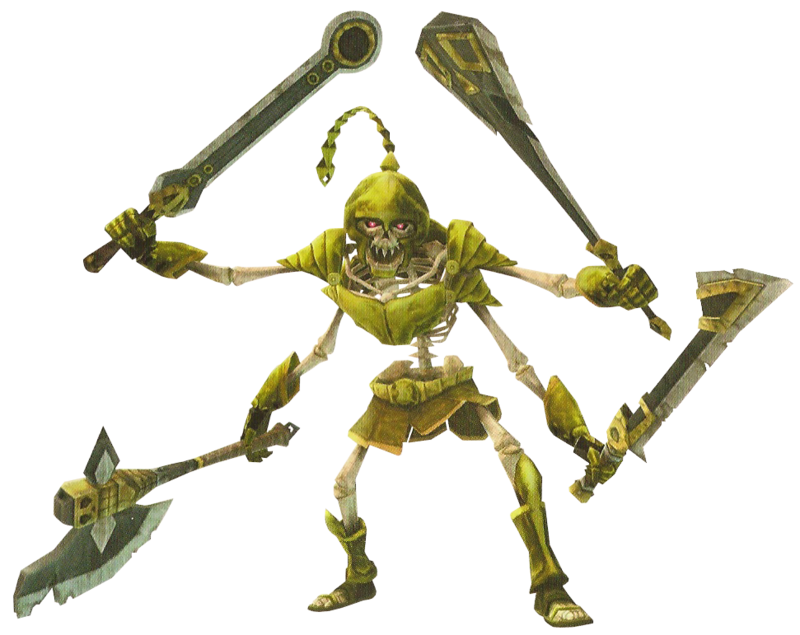 Read More about The Imprisoned at the Zelda Dungeon Wiki. After several hits, the Stalmaster will pull out its two other arms, giving it four arms, each with its own weapon! The stalmaster almost always blocks from three directions and sometimes all four of them. You have to be much more precise when angling your sword slashes. When Stalmaster blocks with all four swords, you can deliver a straight sword attack to harm it. Stalmaster sometimes attacks four consecutive times with its arms, so be careful not to rush in too quickly one it starts attacking. As Stalmaster weaken, the enemy will change its defense even quicker. It gets to the point where it changes so quickly that you don't have time to react. Your best bet is to guess which opening he'll have and if you guess incorrectly, just jump back. Deliver the final sword slashes and Stalmaster will be defeated. 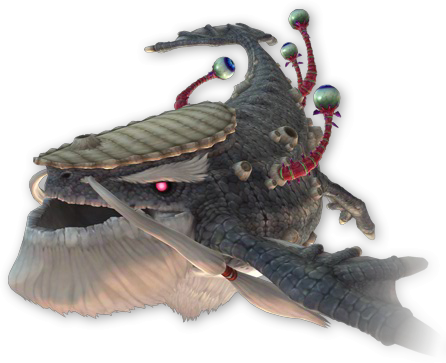 Read More about Stalmaster at the Zelda Dungeon Wiki. 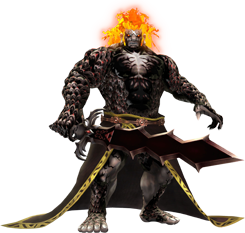 Koloktos has six giant arms and at the beginning of the battle and two of them wield these giant double axe knives. He'll toss these knives at you and they work sort of like boomerangs. These attacks can be hard to avoid, but just keep running and that should do the trick. Don't however run against the outside wall as the knives seem to find their way in that direction. Koloktos will eventually try to hit you with one of its massive arms. Move out of the way and pull out your whip. Latch onto the arm and pull it, separating it from the rest of the body. Repeat this same process until you've latched off four of its arms. At this point you'll see a red weak spot in the center of Koloktos' body. When you have an opening, run on in and deliver consecutive sword slashes. After several sword slashes, Koloktos will reattach all of its arms and the phase starts over. Repeat the exam process once again. 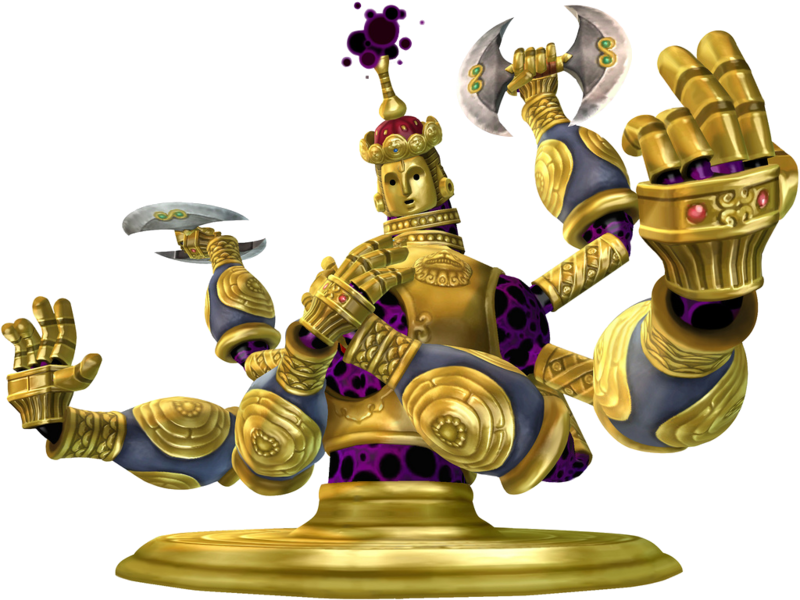 After hitting the weak spot several times, Koloktos will climb up from its stationary spot and will pull out six massive swords, one for each of its hands. Koloktos will now chase you around the room and will occasionally try to hit you with three of its arms at the same time. Dodge these arm attacks and then quickly use your whip to pull them away from Koloktos' body. Doing so will cause those giant knives to fall to the ground, so run on over and pick one up! Once you have one of these giant knives in your hand, you can use it to cut off the limps of Koloktos. More importantly, you can harm its protective cover of that red gem. Just bash at him with the giant knife and unload on its red weak spot. 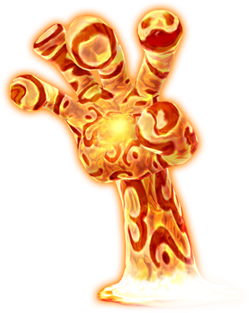 After several hits, Koloktos will gather all his limbs once again. 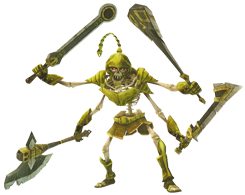 In the final phase, Koloktos will walk around the room constantly swinging all six of its swords. Koloktos will also summon cursed bokoblins, but they are easy to avoid and easy to defeat. Repeat the same process of pulling its arms away from Koloktos and getting a hold of one of those massive swords. Use that sword to damage the weak spot and put an end to Koloktos. 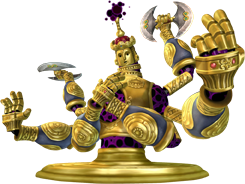 Read More about Koloktos at the Zelda Dungeon Wiki. The whole battle takes place on a narrow platform. Run forward and the battle will begin. 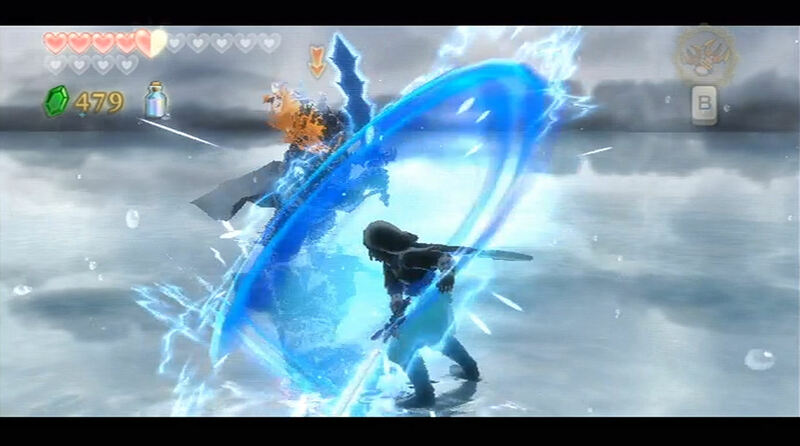 Strike at Scervo where its sword and shield are not blocking. Follow-up with consecutive sword slashes to knock Scervo back. 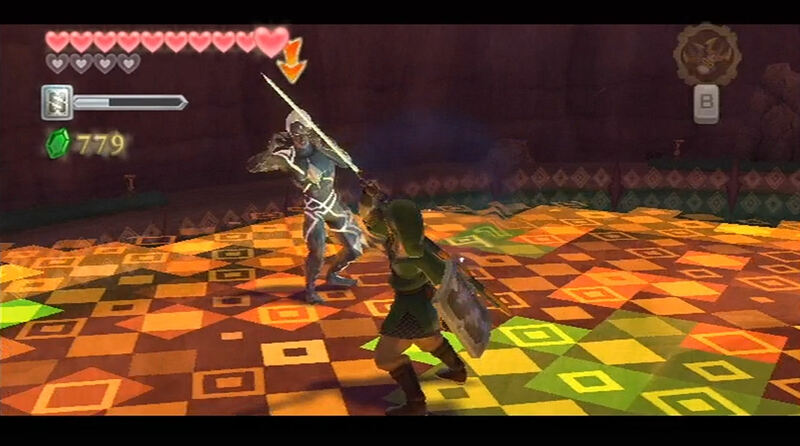 You can use straight forward sword jabs to knock him back as they are quite effective. The key is that if Scervo blocks any of your attacks, he'll immediately follow it up with an attack of his own, so take a step back. Alternatively, when Scero attacks you can deliver a shield bash, stunning Scervo in the process. You can also use the Gust Jar to stop Scervo from moving, and keeping him back near the edge of the platform. 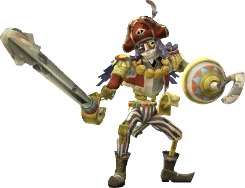 Keep hitting Scervo to knock him towards the end of the plank. This will cause Scervo to pull the wooden spike at the end of the platform closer, making the battle space smaller. Repeat the same process of slowly but surely knocking Scervo back. 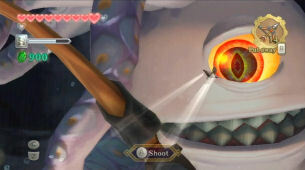 During the second phase, Scervo will sometimes attack twice in a row, so be patient. It's important to get successful hits early on, to avoid the spike that is at your back. Keep knocking Scervo back until he's right at the edge. Scervo will move the spike even closer, but this time he doesn't have a sword. You don't have much room behind you at all, but because he doesn't have a sword, it's easier to land hits. During this phase it's important to be more aggressive. When he is winding up to hit you, deliver a hit before he can do so, and he'll be sent back. You'll need to be more precise with your shield bash in order to knock Scervo back. Keep at it and knock him off the edge. 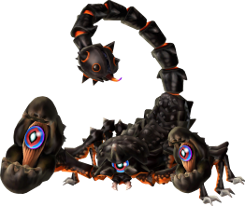 Read More about Scervo at the Zelda Dungeon Wiki. 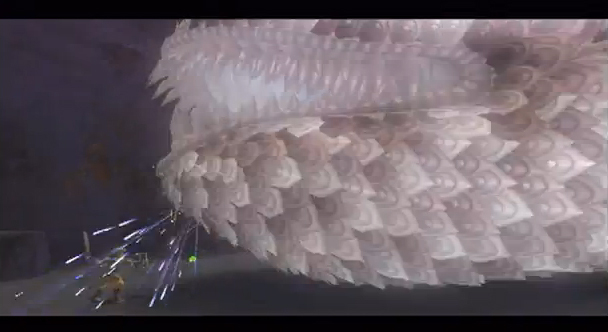 During the first phase of the battle, a number of the tentacles will come up from underneath the ship. 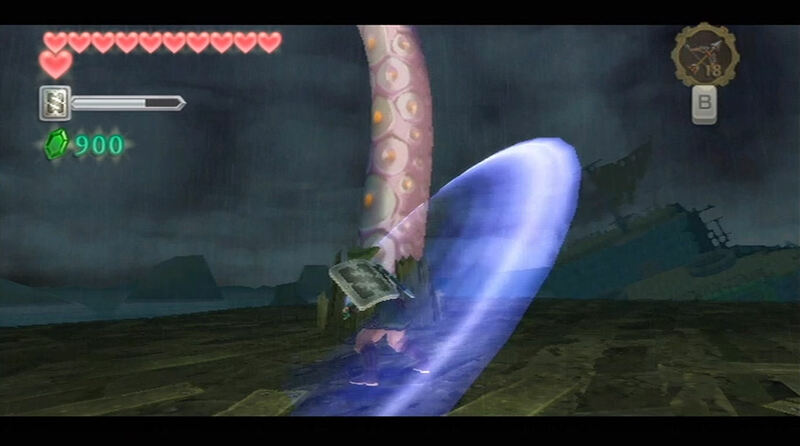 Just constantly charge a Skyward Strike and hit as many of these tentacles as you can. 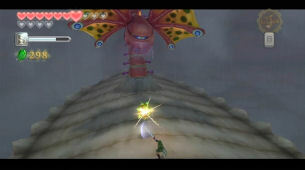 When you hit these tentacles, swing your sword horizontally, so that the tentacles are actually cut off from the boss. Some of these tentacles will try to grab at you, so either hit them quickly with a Skyward Strike, or try to dodge them. If they do grab you, just shake the Wiimote to free yourself. 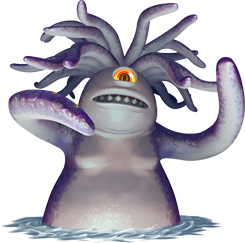 After cutting several tentacles, Tentalus will come from underwater and will try to strike you with its tentacles once again. Pull out your bow and shoot an arrow at the eye of Tentalus. Tentalus will come crashing down, so run on over and deliver as many sword slashes to its eye as fast as you can. You'll have to repeat this whole process a few times and each time it gets progressively more difficult. The tentacles will come up more frequently from underneath the ship and more of them will come up at a time. Just keep delivering horizontal Skyward Strikes to cut them off. Hit the eye of Tentalus several more times and he'll eventually start hammering down on the ship with his tentacles. This will cause one of the nearby boxes to fall to the lower level. Run on over and use the box to reach the other platform. Tentalus will dive underwater and appear at the other end of the ship. In this final phase of the battle Tentalus will send its tentacles at you once again, but this time the ends of the tentacles will have teeth and try to knock you off the ship. If they knock you off, you'll lose a heart and just reappear back on the ship. 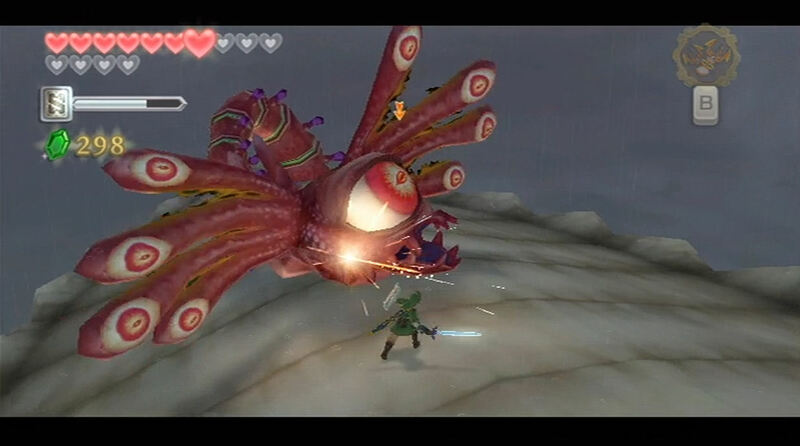 Simply use your sword to slash these tentacles away. When you have an opening, pull out your bow and arrow and shoot the eye of Tentalus once again. Run on over and deliver the final blows with your sword. 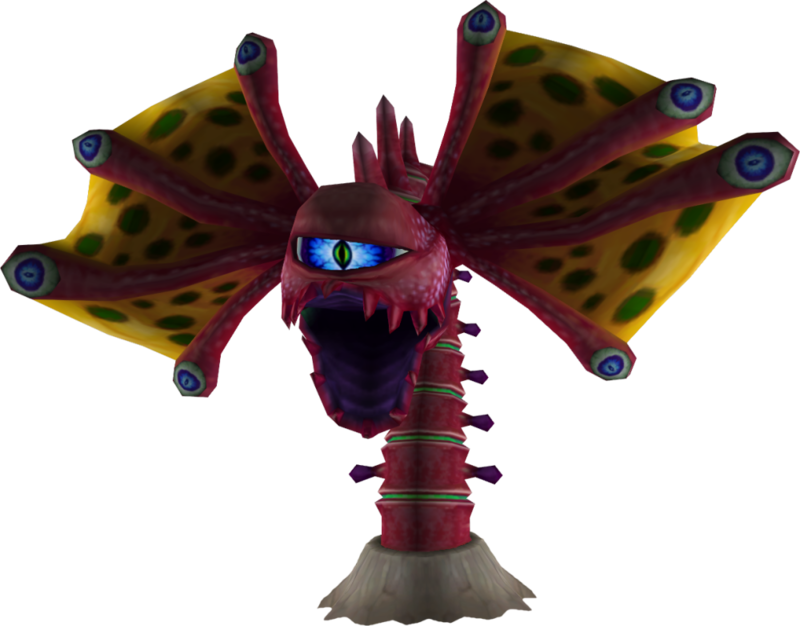 Read More about Tentalus at the Zelda Dungeon Wiki. Here you will take on the dungeon mini-boss, the Magmanos pair. Jump down and stand on the rock to the left. One of the Magmanos will appear and push you upward. Jump over and then perform a jab with your sword on one of the nearby plants. Link will have an orb attached to his sword now. What you want to do is jump back down to where the Magmanos are. Walk around the steel cage on the ground and once one of the Magmanos come up, toss the water bulb at it, and it will turn into solid rock. Slash away with your sword and the Magmanos will crumble to pieces. Repeat this same method with the second Magmanos to defeat this mini-boss. 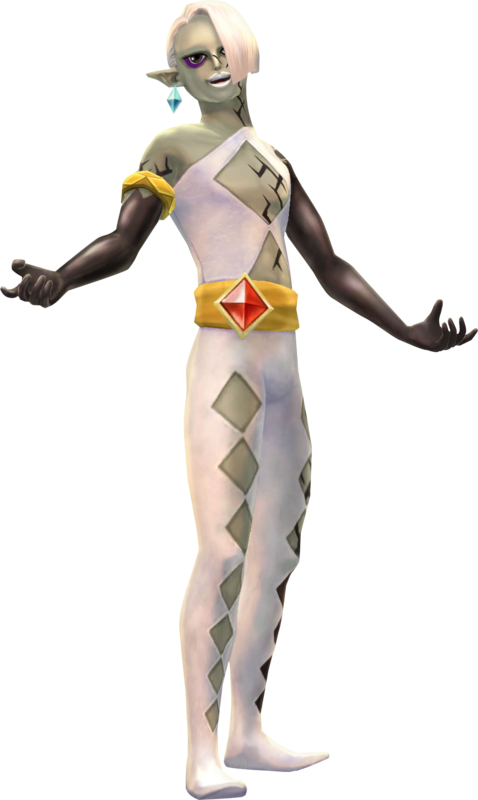 Read More about Magmanos at the Zelda Dungeon Wiki. 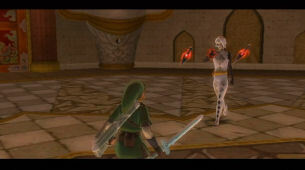 Once you arrive, you'll go through a cutscene with Ghirahim once again. Afterwards he'll take off his gloves and ready himself for battle. The first phase of the battle will have Ghirahim slowly walk around the room, summoning these small red diamonds. These diamonds serve as both defenders and attackers. 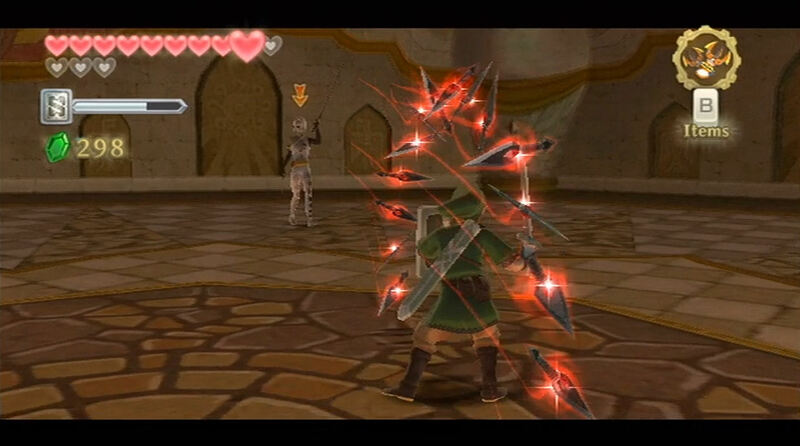 If Link is in the distance, Ghirahim will send these red diamonds out towards you trying to harm you. 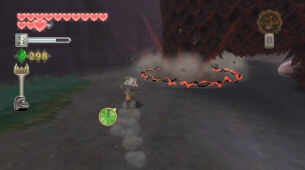 If Link is nearby and tries to slash in one of those directions, he won't hit Ghirahim, but he'll hit a diamond instead. You have to be quick and patient with your sword slashes here. If the diamonds are at the top and bottom, this means you'll only be able to land horizontal sword slashes. You will have to deal with Ghirahims fingers catching your sword. Quickly move your sword around, and deliver a sword slash where his fingers aren't. This can be incredibly frustrating, but just keep working at it. After a few hits, he'll summon four diamonds at a time, so you'll have to be even more precise. 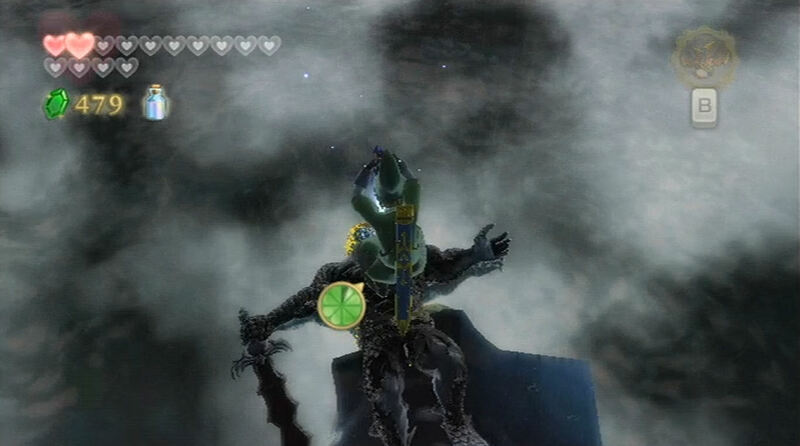 After several hits, Ghirahim will jump back and pull out two swords. This time he'll summon diamonds around Link in various formations. Sometimes they are directly overheard in a upside down 'U' shape. Shake the Wiimote and Nunchuck forward and back to do a vertical spin attack and get rid of these. 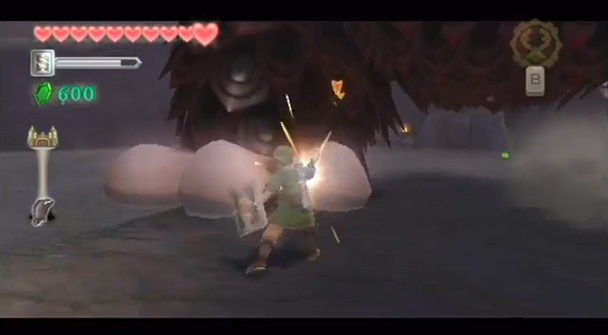 Other times the diamonds will surround Link, so to a standard spin attack to get rid of them. 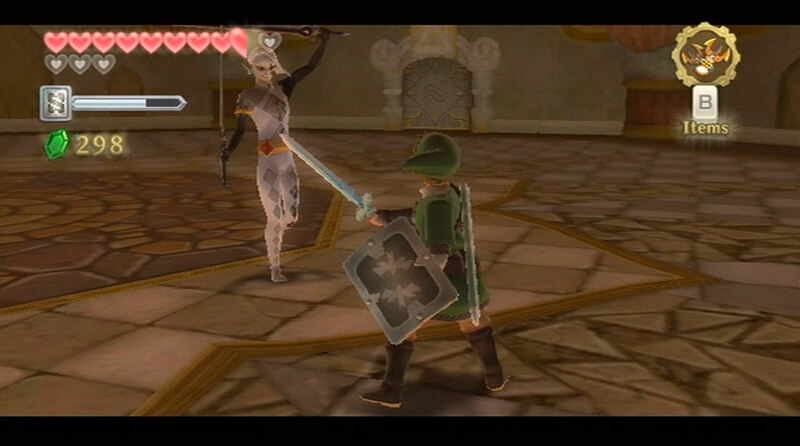 Draw near Ghirahim and he'll use his two swords to protect two sides of his body, much like a Stalfos. 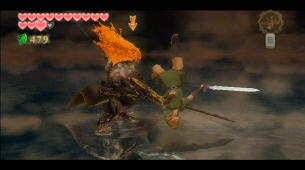 Quickly hit him in one of his unprotected regions and then follow it up with a number of sword slashes. 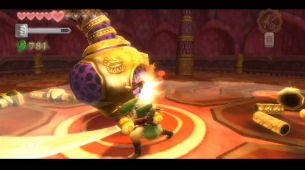 After several hits, Ghirahim will start to get more aggressive. Each time you draw near, Ghirahim will try to slash away with his sword. 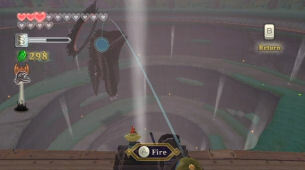 In this phase Ghirahim will also jump up in the air trying to land right one top of you with his swords. 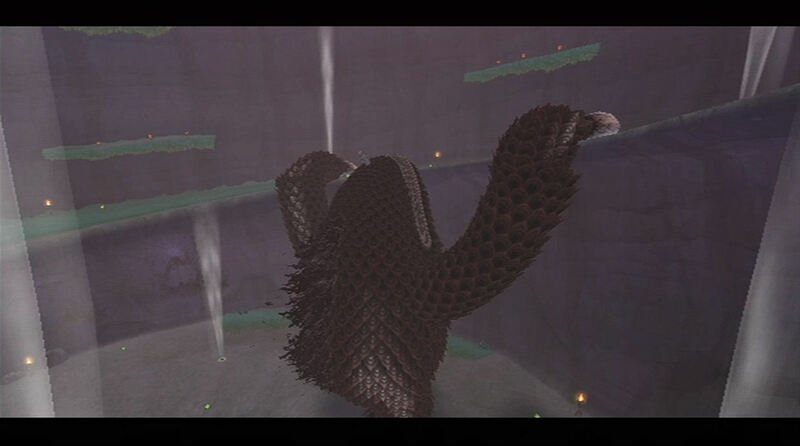 As soon as he jumps, sprint around the area and Ghirahim will miss when he lands. Deliver a sword slash in a different direction than where his sword is blocking and you'll hit him. Follow it up with a number of sword slashes to harm him. 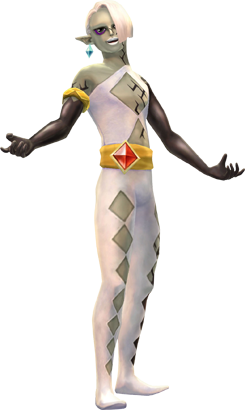 Ghirahim will also shoot out diamonds in groups of five at you, changing the direction they come in, so be quick to adjust and deflect these diamonds. Just hit Ghirahim in the various ways during this phase and after a number of hits, he will be defeated. The battle is a bit different this time around as The Imprisoned now has the gigantic arms to deal with. The first phase is still rather similar. Slash at its giant toes to cause it to fall to the ground. However, with each step it takes, it gives off a large red electric charge, so it's quite difficult to get in close. Additionally, now that The Imprisoned has arms, it will try to climb up the sides, so you don't want to allow thato happen. Once the Grooseanator has powered aim, call on over and use the catapult to send a bomb flying at The Imprisoned. This will keep him at bay for a short period of time, allowing you to get quality sword slashes in for its toes. 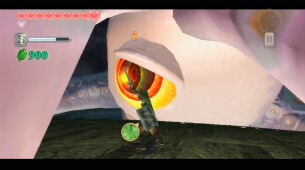 To attack The Imprisoned in perhaps and quicker and more effective way, you can also use the Sail to float up to the next level of ground above the monster. When he draws near, you can jump onto his head and slash at the pillar on its head. The Grooseanator will take a few moments to setup once again, so you'll be on your own for a few moments. Once it is ready, deliver another bomb attack and finish off the toes, sending The Imprisoned to the ground. You won't be able to run around The Imprisoned this time. Since it has those massive arms that take up a lot of room, you can just run around it. You'll have to jump down to the ground level below, run behind it and use an air geyser to get back up. Run on over to the seal on its head and deliver three uppercut sword slashes to knock that seal back in. After the second set of three sword slashes to the Seal, The Imprisoned will fall on its stomach and slide its way up a considerable amount of the Sealed Grounds. Follow it up using the wind geysers and repeat the same method once again. 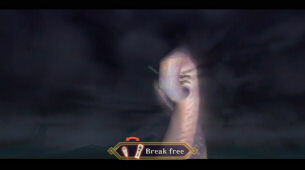 After a total of nine strikes to the Seal on its head, The Imprisoned will fall back into the seal at the bottom of the Sealed Grounds. Jump on down and deliver a Skyward Strike. 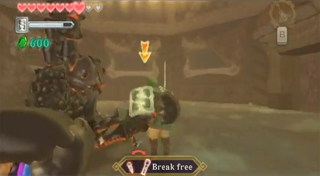 Use your Wiimote and deliver strikes in proper angles to fully seal The Imprisoned once again. Jump off one of the nearby ledges and summon your Loftwing. 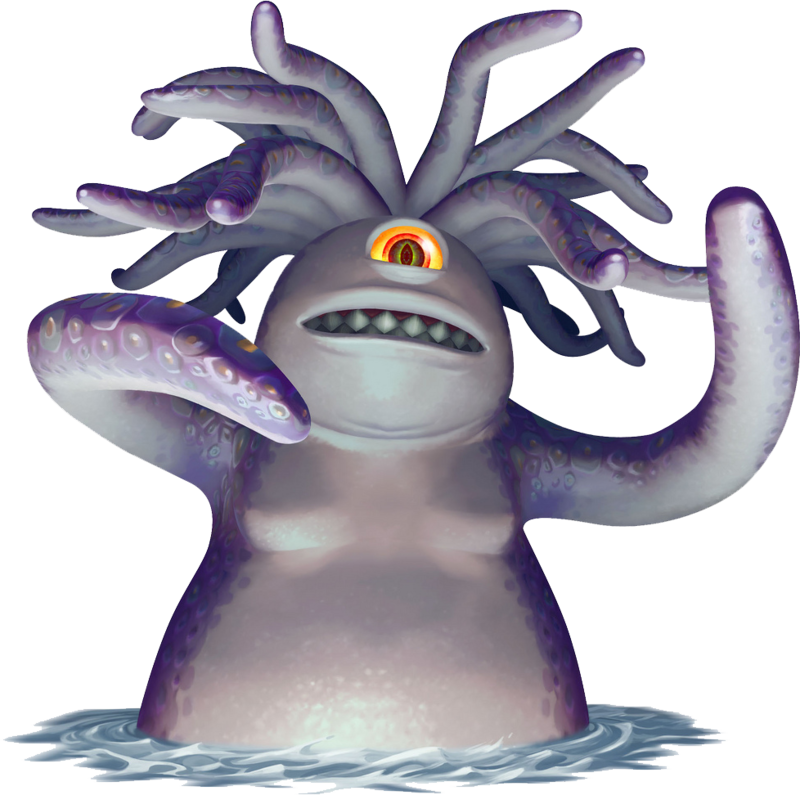 Levias has four large tentacles coming out from its body, with each one having a large eye at the end. 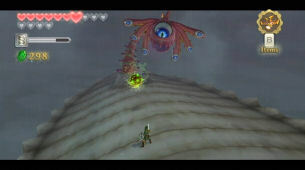 Fly on over with your Loftwing and when you are close enough perform a Spiral Charge to knock out the eye. Be weary of the other flying enemies in this area and if they come closer to you, perform a Spiral Charge to get rid of them as well. There isn't much else to the Levias boss battle. Just keep battling and defeat all four of its eyes. Afterwards fly on over and jump off of your loftwing to land on its back. If you miss the landing, just summon your Loftwing once again. Once you land, the boss battle with Levias changes to a new boss battle with another creature. 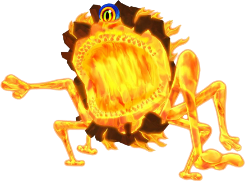 Read More about Levias at the Zelda Dungeon Wiki. The battle with the Ocular Parasite Bilocyte will begin. This parasite will shoot out a green blob at you and you will have to swing your sword to knock this blob back at the parasite. Your first goal is to knock the wings off of Bilocyte. 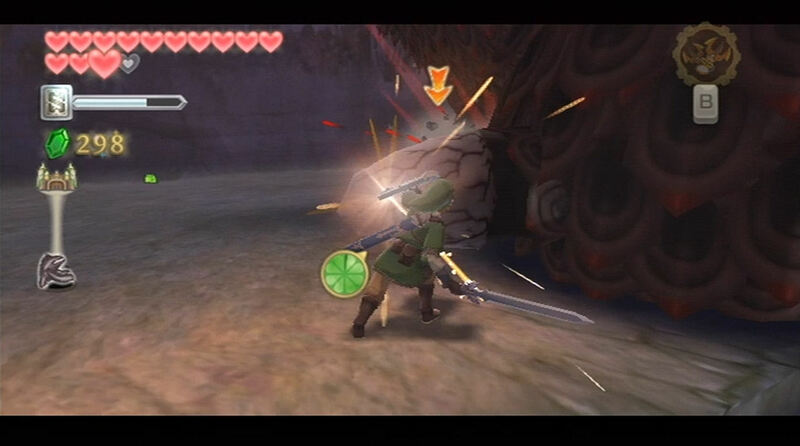 To hit the wing on the right, swing your sword from left to right so direct the green blob at that wing. To hit the wing on the left, swing your sword from right to left. After knocking off its wings, Bilocyte will change its attack pattern. After shooting the blob at you, it will move its head to the left or right, and sometimes eve staying right in the middle. You must deflect the green blob back at Bilocyte, depending on the direction at which it has moved its head. If it doesn't move its head at all, deliver a vertical sword slash to knock the blob right back at it. Each time you hit its eye, run on up and stab away with the master sword to harm it. Bilocyte will get back up and it will grow out its wings once again. Hit the wings and hit Bilocyte with a number of its own green blobs. Keep at it and Bilocyte will be defeated. Read More about Bilocyte at the Zelda Dungeon Wiki. The first part of The Imprisoned battle is identical to the previous battle. Smack at its toes and use the Grooseanator to keep it at bay. After hitting the seal on its back three times, The Imprisoned will begin to fly! Ya, that's right. 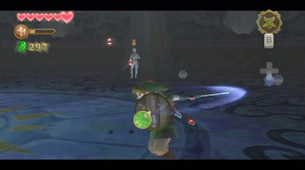 Once Groose is ready to operate, hit The Imprisoned with another bomb, causing it to fall to the ground. Run on over and deliver several sword strikes to the seal on its head. During the third phase, problems will arise as Groose has been cut-off from his bomb supply. Run on over and use a series of wind geysers to ride all the way to the top of the Sealed Grounds. Run on over to Groose and he'll suggest to catapult you onto The Imprisoned's head. Jump into the catapult and use it to shoot yourself on the Imprisoned's head. Deliver three overhead sword strikes to defeat The Imprisoned once again. 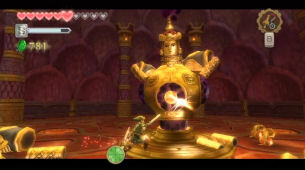 Deliver a Skyward Strike and then perform directional swipes with the sword to restore the seal. 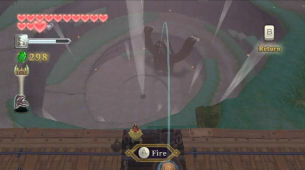 The goal in this battle is to hit Ghirahim down to the platforms below. Ghirahim will occasionally attack with some punches and kicks, so be prepared to jump back. 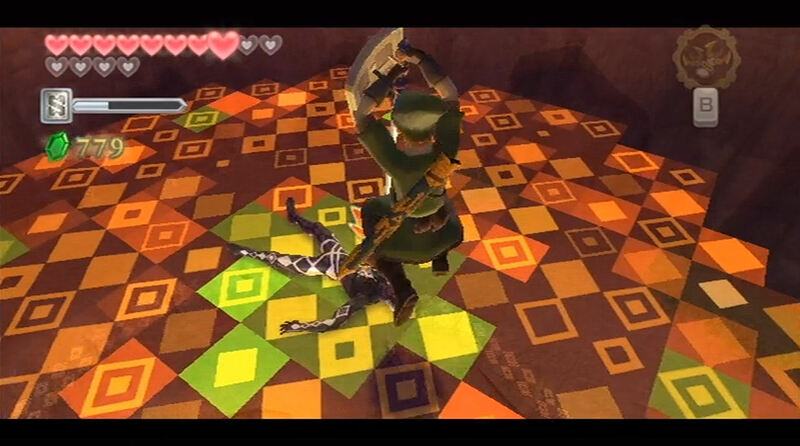 Ghirahim will block your attacks at first, but with each attack, he'll be sent backwards just a bit. Slash away with your sword to knock him to the edge and then hit him down to the platform below. Once you are here, deliver a fatal blow. 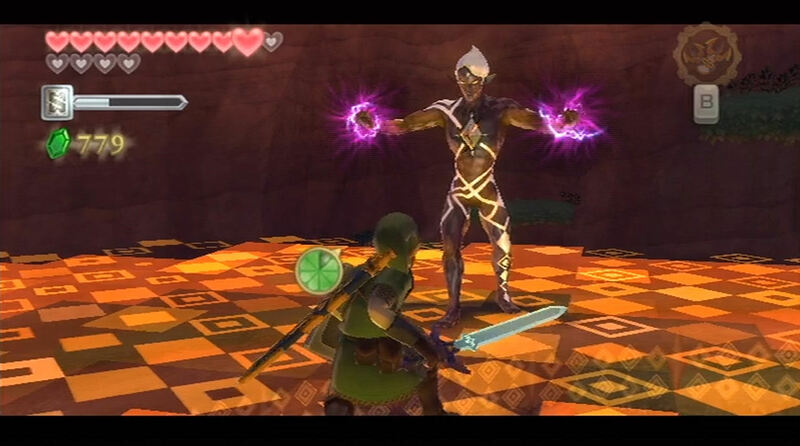 After hitting him a number of times, Ghirahim will start holding these purple rays. You have to still slash at him with your sword, but slash in the directions so that you don't hit the purple rays that he is holding out. Knock him down to the platform below and deliver another fatal blow. 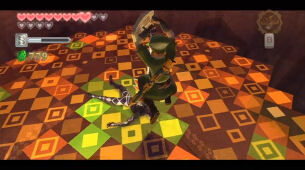 Continue knocking Ghirahim down until the two of you are at the ground level. 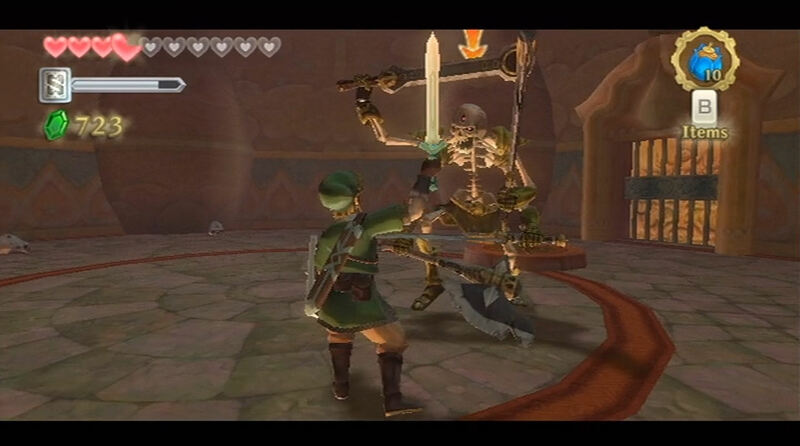 Ghirahim will then pull out his sword. If you run up and try to harm him with sword attacks, he'll block every last one of them. What you want to do here is keep your distance. When you are further away, Ghirahim will launch a red beam attack towards you. Swipe your sword in the same direction as the beam attack, sending it back flying towards Ghirahim. He will block several of them and some of them he'll deflect right back towards you. Play a game of pong and keep hitting the beam back at him until it harms him. Run on over and deliver sword jabs right to his chest. Repeat this same process a few times. 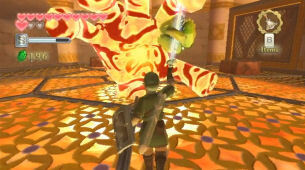 Ghirahim will eventually pull out its much larger sword and will try to swipe you with it. 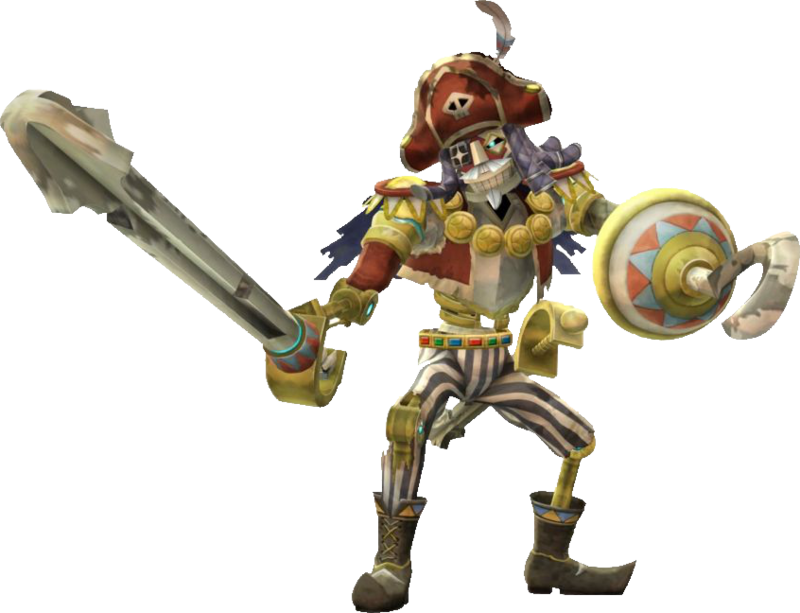 When you run up and swipe at him, he'll block with his sword, but the sword will take damage. 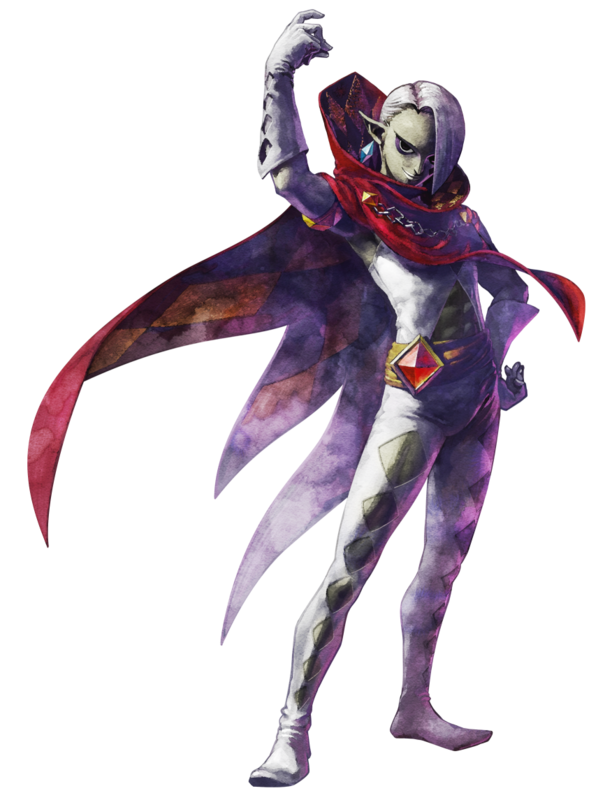 If his sword takes and damage and you don't capitalize on it, Ghirahim will jump back, snap his fingers, and restore his sword to original form. 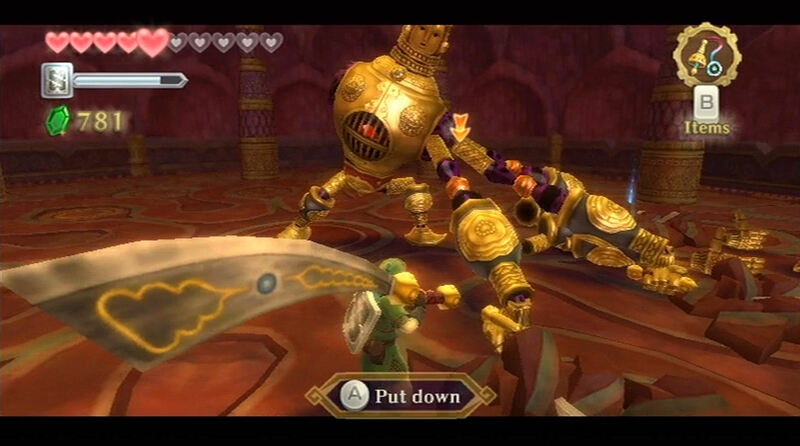 What you need to do is hit his sword and then continuously hit it solid as if you were clashing swords. With each continuous hit, the sword will crumble and it will eventually break. 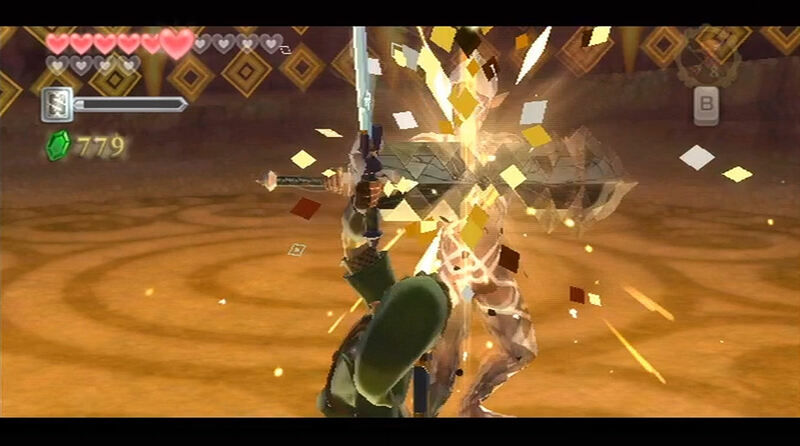 Deliver a number of consecutive sword slashes in a row before Ghirahim is able to regenerate his sword. Repeat this process a few times and perform a few jab attacks with your sword. 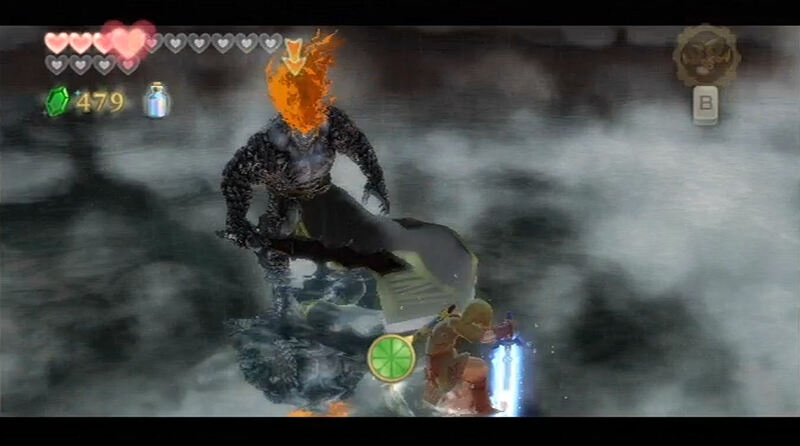 After enough hits, Ghirahim will be defeated for good. You want to keep close to Demise as much as possible. If you stay distant from Demise, he'll come at you with a charging sword attack which can be quite damaging. Run on up to him and deliver sword slashes. 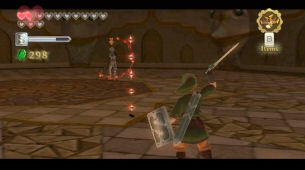 While he'll block your initial attacks, follow them up with sword slashes where his sword cannot defend. After a few blocked attacks, you will be able to successfully land one against Demise. As soon as you see Demise prepare an attack, you should immediately jump back to avoid getting hit. The best way to hit Demise consistently is to run up, deliver a forehand sword slash from right to left, and then immediately follow up with a backhand sword slash from left to right. Just keep alternating between left and right and you'll eventually hit him. Immediately after you hit him once, jump back as he is likely to attack. 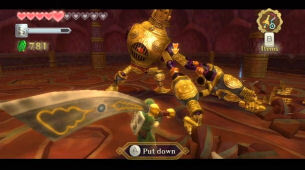 Repeat this method until you've his Demise around 28 times with the Master Sword. 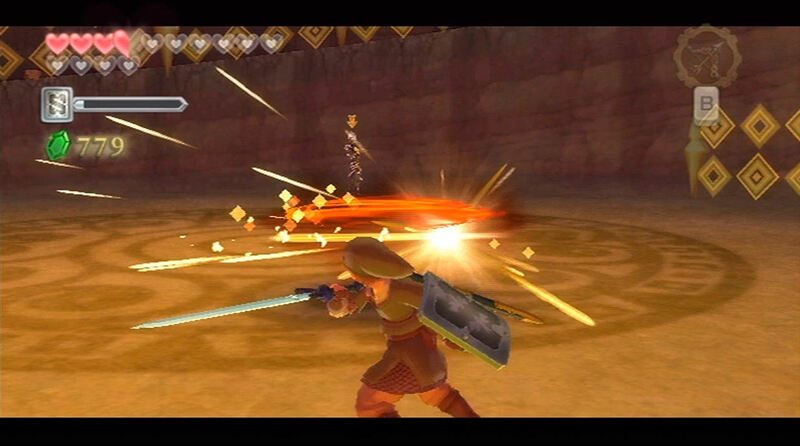 During the next phase of the battle, the entire arena starts to fill with rain, thunder, and lightening. Raise your sword to the Sky to prepare a Skyward Strike. 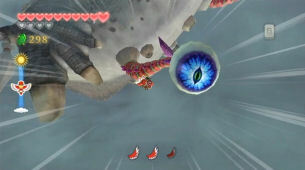 As soon it is ready and you are targeting Demise, unleash a Skyward Strike at him. You have to be quick here, since Demise will try to hit you almost immediately after the Skyward Strike has been prepared. Demise will prepare his own Skyward Strikes during this phase. If he already has a Skyward Strike charged and you toss one of your own at him, they will cancel. After you successful hit Demise with a Skyward Strike run on over and deliver consecutive sword slashes at him. Once Demise falls to the floor you'll have an opportunity to deliver a Fatal Blow, but don't do it. Demise is not weak enough for you to hit him. It's best to try to stay close to Demise as much as possible, as whenever you are distant from him, he will perform a charge attack towards you that is incredibly hard to avoid. He almost always performs a charge attack after getting up from the ground. Repeat this same process if hitting Skyward Strikes and slashing at Demise. The third time that Demise falls to the floor deliver a Fatal Blow to defeat him once and for all. 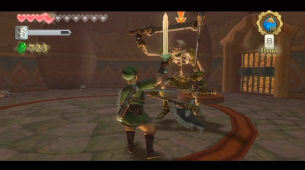 Read More about Demise at the Zelda Dungeon Wiki.